In 1931, Sewall Wright—a quiet American geneticist specializing in livestock and guinea pigs—published a GENETICS paper that changed how we study evolution. Wright’s “Evolution in Mendelian populations” was one of the founding documents of population genetics and was among the first formal frameworks to reconcile Mendel’s laws of inheritance with Darwin’s vision of natural selection. In the January 2016 issue of GENETICS, Senior Editor Nick Barton introduces Wright’s 1931 opus as one of the journal’s 100th anniversary Classics. In the paper, Wright used mathematics to describe how genetic variation in a population is affected by migration, mutation, selection, and chance (genetic drift). He then applied these equations to argue for his “shifting balance” theory of evolution, an idea he would pursue and defend for more than fifty years. In this theory, the optimal conditions for adaptive evolution occur only in large populations subdivided into partially-isolated groups. In the smaller subpopulations, genetic drift has an outsized influence that allows these groups to diverge more rapidly. Those subpopulations that happen onto a more adaptive combination of allels than the population as a whole will then spread and take over. 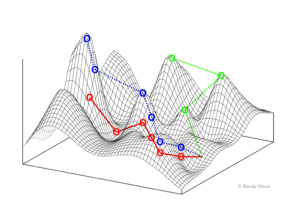 In 1932 he presented an influential metaphor to accompany this theory – the famous “adaptive landscape” of fitness peaks and maladaptive valleys traversed by evolving populations. Large, freely mixing populations tend to get trapped in locally adaptive peaks, he argued, while subdivided populations can more efficiently explore the broader landscape of gene combinations. A modern example of an adaptive landscape visualization. Height represents fitness, and the X and Y axes represent genotype. The colored lines represent different paths that a population could follow while evolving. “Visualization of two dimensions of a NK fitness landscape” by Randy Olson. CC BY-SA 3.0. Though a theoretical work, Wright’s shifting balance theory was profoundly shaped by his immersion in the pragmatics of commercial animal breeding. 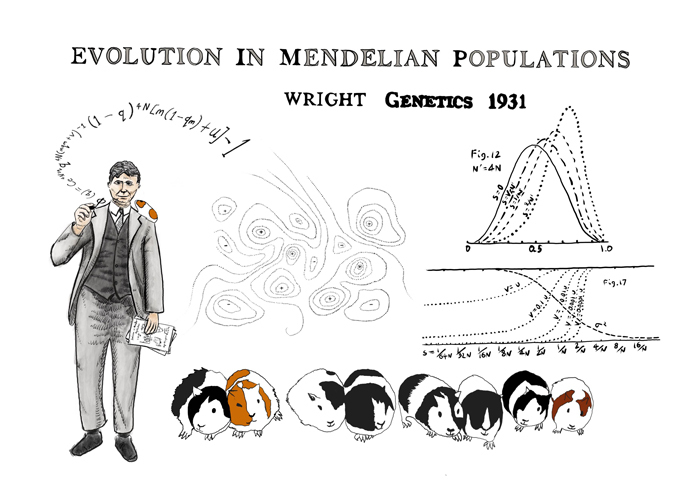 “Evolution in Mendelian populations” was written as Wright was finishing up ten years as senior “animal husbandman” at the US Department of Agriculture, where he had developed sophisticated statistical tools to examine the Department’s extensive breeding records. For example, he revealed that the shorthorn cattle breed had developed by patchwork change: bulls from a handful of the best herds were used to improve the whole breed. Wright argued that something similar would happen in evolution of natural populations. To Wright, these “cumulative accidents of sampling” demonstrate how small populations would be able to drift away from a locally adaptive peak in the fitness landscape, across a saddle to scale an even higher peak. 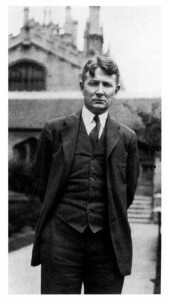 Wright in 1928, shortly after moving from the USDA to the University of Chicago. From Hill (1996). Shifting balance theory was influential, but far from uncontested. It fueled a famous, life-long, and sometimes bitter conflict with another population genetics pioneer, R.A. Fisher, a debate that has continued in the field even after Wright’s death in 1988. Wright was also one of the founders of the Genetics Society of America, serving as its third president (in 1934), and was a notoriously thorough reviewer for GENETICS. Read more about Wright’s work and life (including his ability to monologue about certain topics, among them guinea pigs) in Jim Crow’s affectionate obituary. Wright, S. (1931). Evolution in Mendelian populations. Genetics, 16(2), 97. Barton, N. H. (2016). Sewall Wright on Evolution in Mendelian Populations and the” Shifting Balance”. Genetics, 202(1), 3.